It’s finally Raksha Bandhan and after all that love we received from our first ever package offering, we are eating up all the sweet pics that are coming our way of brothers AND sisters showing off their rakh star rakhis. 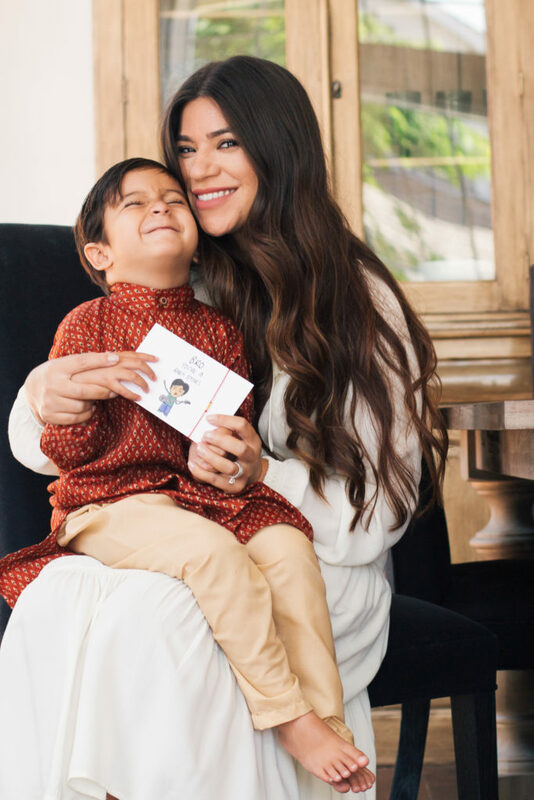 THANK YOU to all of you who supported us in our sister rakhi movement in the hopes of not only modernizing a tradition that we cherish, but also giving it an artsy spin with fun cards and packages all ages can smile about. We recently linked up with a fashion lovin’ momma and we were digging what she had to say about the holiday. Not only is she inspiring moms out there with her passion and zest for life (including the chai mommas! ), but she’s diving deep into the Indian culture as a mom who is NOT Indian herself (she’s Mexican). Founder of South Coast Style OC Amanda Upadhyaya shares her beautiful perspective on Raksha Bandhan with us. How has this holiday and ritual personally impacted you and family life? Since I am Mexican and my husband in Indian, this was a new tradition and celebration to me when I first met my husband. He is an only child but has female cousins who he would always celebrate with. He has one cousin that lives local so every year we try to plan a family dinner to celebrate with her and his other cousins that live out of state have always mailed him a Rakli bracelet and letter which he wears religiously! Now that we our son, Rajan, it has been fun to introduce my side family to this tradition since our son doesn’t have any cousins on my husband’s side of the family yet. I have niece, whom Rajan calls his sister, so we are excited to surprise her with the Rakhi bracelet from Chai Mommas this year; she will be SO excited and I know she will want to celebrate every year which will be fun for our family, we love blending the different cultural traditions. I am Mexican so I didn’t grow up having a celebration like this but I know I would have loved it if we had! I have two brothers, one older and one younger, and a sister and I cherish them – they are pretty much my best friends, so this would have been something I would have loved celebrating growing up. Now that our family has been introduced to this tradition I love that my nephews and niece will get to celebrate with my son. How have you as a mom conveyed this message to your child without having any background on this? Since my son is an only child I have always raised him to treat his cousins like siblings, that is something that is very important to my husband and I. Because our son will always have exposure to both of our cultures and traditions we place huge importance on every tradition we can with our families. My husband’s mom is very great about helping me learn the history and importance of each tradition on our Indian side and we then as parents instill the value of them into our son. I do my best to always do my research and ask my husband’s cousins questions about anything I may not know and they are wonderful about keeping me informed on what to prepare for and what to expect when needed. It’s been a huge family effort and over the years I think it makes my husband’s family excited to celebrate from a new perspective with me and my family since everything is new and exciting to us. What’s the part of this ritual that speaks to you the most? My favorite thing about this ritual is the value that is placed on sibling relationships. I grew up SO close to my brothers and sister, we are all best friends, so for me the fact that there is a ‘holiday’ to celebrate the importance of those relationships is incredible. I think there should be a western holiday/tradition to celebrate siblings, they are the biggest blessing in the world to grow up with. The tying the thread and praying for protection for one another is so personal and special – I say prayers everyday for protection of my siblings, especially now that we are all adults and living our individual lives, what a special symbol for them to see that thread every day as a reminder of how loved they are! Sibling love is universal…Happy Raksha Bandhan to all the families out there!